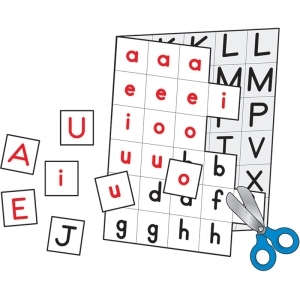 Supporting the Four-Blocks® Literacy Model, this set includes 12 student sets of cut-apart letter cards with four of each vowel and two of each consonant. 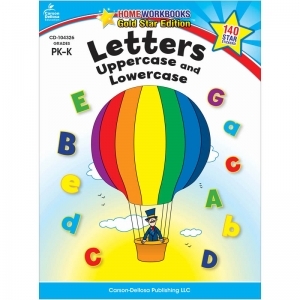 Each card features lowercase letters on one side and uppercase on the other. 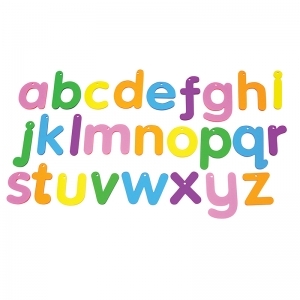 This assortment includes capital letters in assorted bright colors. Perfect for a variety of arts and crafts applications. Each pack includes 104 pieces, each measuring 1.5" tall. Set of 26 letters in a child friendly font made in colorful clear acrylic. Ideal for use on a light panel to make letter recognition interesting and exciting. Letters measure 2.75" and come with a hole at the top balance point so they can be strung up or pinned to a bulletin board. Made for little fingers! Flexible foam is chunky and easy to handle. Perfect for letter identification, phonics and word building/spelling activities. Four colors make this set playful and entertaining. 58 letters total: 6 each A, E; 5 each I; 4 each O; 3 each N, R, T; 2 each B, C, D, G, H, L, M, S, U; 1 each F, J, K, P, Q, V, W, X, Y, Z. Magnets are 2 inches tall, and sets are packed in a handy storage bucket with illustrated booklet. Made for little fingers! Flexible foam is chunky and easy to handle. 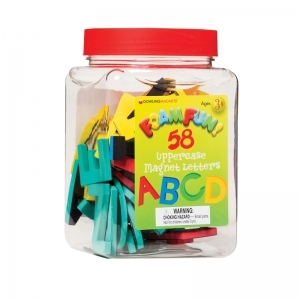 Perfect for letter identification, phonics and word building/spelling activities. Four colors make this set playful and entertaining. 70 letters total: 6 each a & e; 5 each i; 4 each h, o, s; 3 each n, r, t, u; 2 each b, c, d, f, g, j, k, l, m, p, v, w, y; 1 each q, x & z plus punctuation. 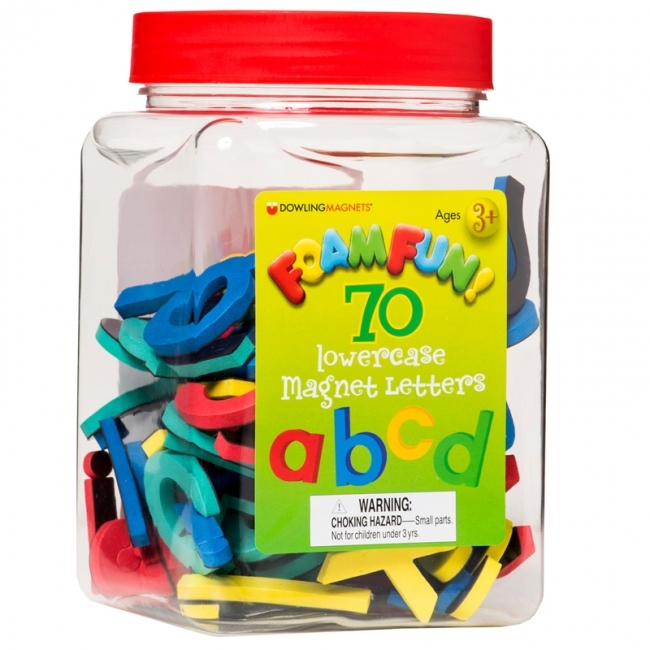 Magnets are 1 to 2 inches tall, and sets are packed in a handy storage bucket with illustrated booklet. Students will be proud to have their very own books, and teachers will love watching their progress! 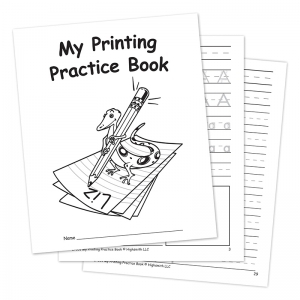 My Own Printing Practice Book includes a printing practice page for each letter of the alphabet, space on each page for the student to illustrate a word that begins with that letter, and pages to practice writing simple words that start with each letter. A ready-to-color cover adds to the fun. 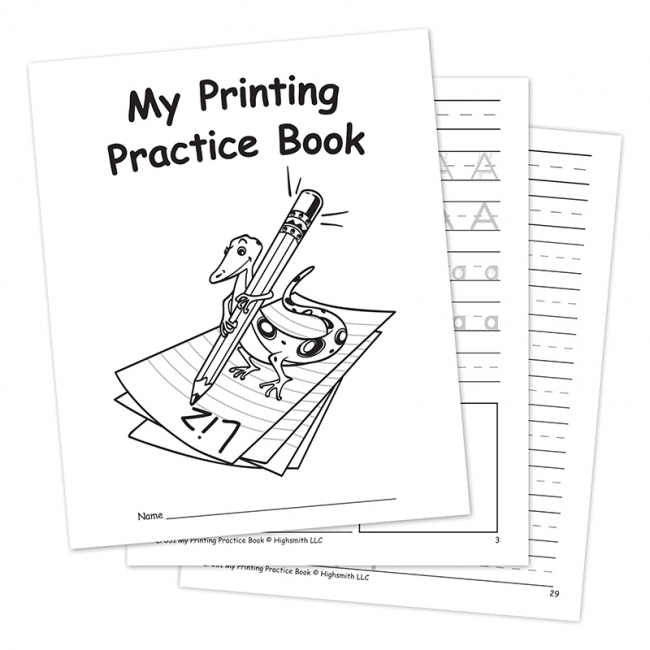 Includes 32 pages, and measures 8-1/2" x 7". Aligned with Common Core and State Standards. Supports requirements of Title I and other federally funded programs. 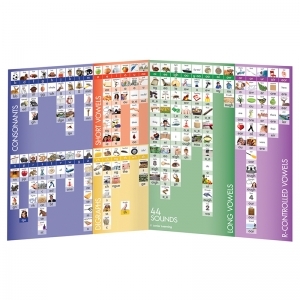 Eureka Manipulatives are great for teaching early childhood learning and a great tool in helping students recognize connections within each educational topic. 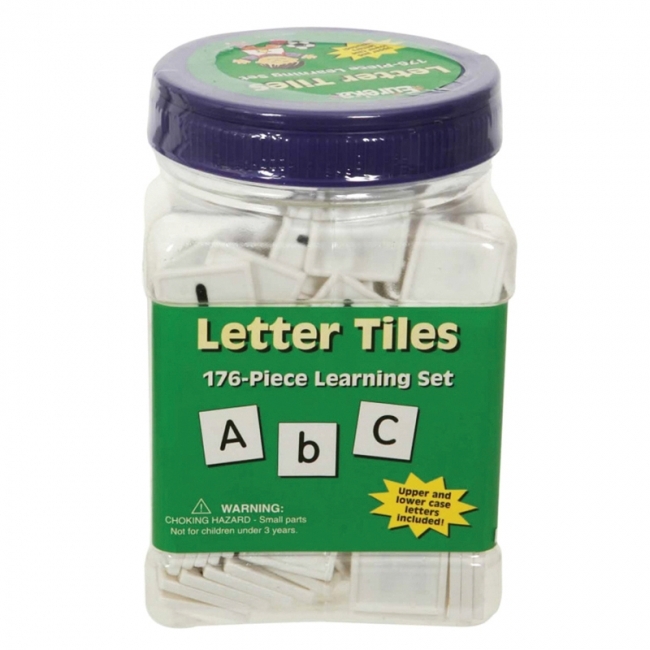 Each pack includes 176 one-inch square plastic tiles with lower and upper case letters of the alphabet in a plastic storage tub. Teaches letter recognition and spelling. Plastic tub measures 3.75" x 5.5" x 3.75". Not for children under 3 years of age. 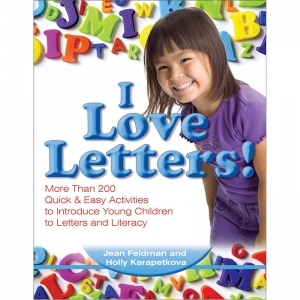 Open the door to reading, writing, and a lifetime of learning with this exciting introduction to 26 letter "friends"! 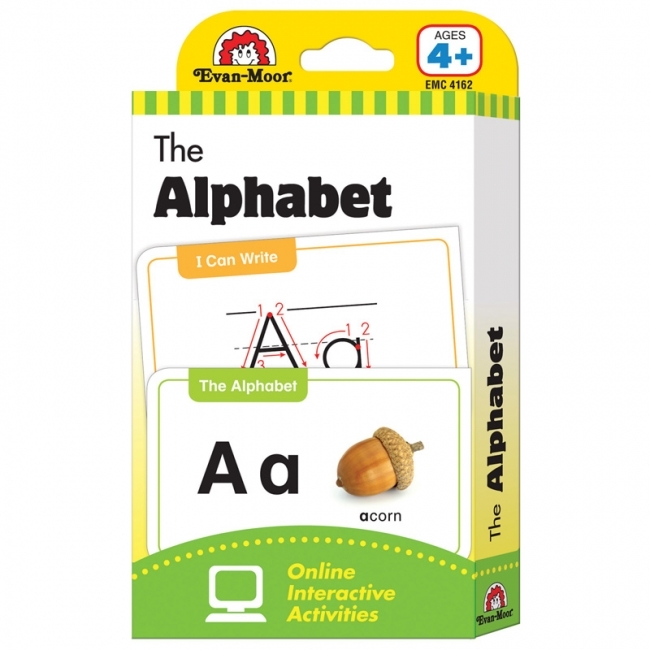 Start children on a path toward a lifetime of reading with more than 200 activities, games, and songs that introduce them to the alphabet. It all begins with 26 letters. 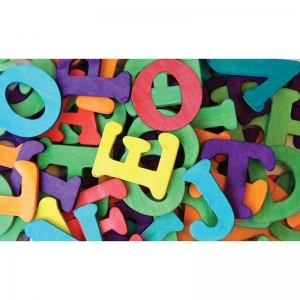 The wiggles and squiggles that turn into words, stories, poems, and great literature are the tools for future readers. 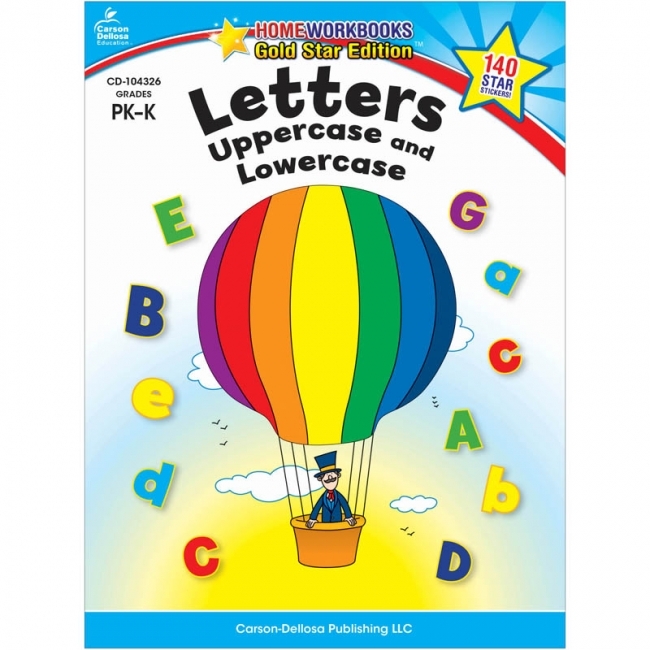 Children will love learning their letters as they play the Name Game, sew their own letters, create Puzzle Pairs, and more! Jean Feldman and Holly Karapetkova apply their signature creative style to teach literacy skills and the alphabet! 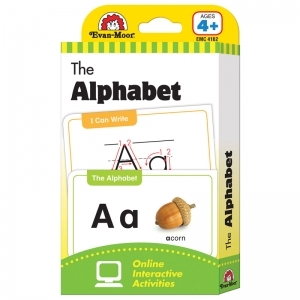 Let learning the alphabet be a fun and enjoyable experience for everyone by employing these easy to use alphabet flash cards. 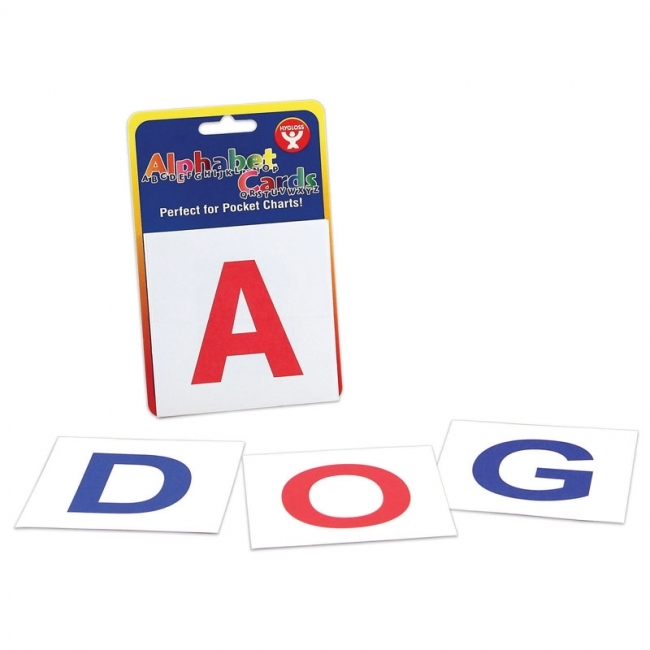 Foster easy letter recognition with alphabet cards, or use them to help build word or letter blends, spelling skills, and simple or complex diagraphs. 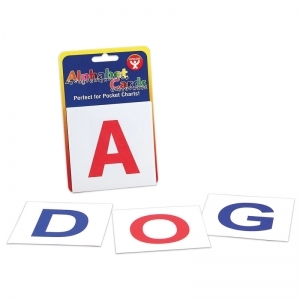 With bright and bold flash cards, alphabet letter recognition is simple. 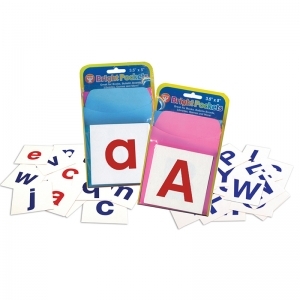 These alphabet flash cards come with an individual card for each letter of the alphabet, A-Z, and four blank cards for misplaced cards, wild cards, or other improv needs. Use sets as flash cards for quick letter review or hang along the walls and mount to bulletin boards to constantly reinforce the letter forms. Alphabet flash cards make learning the ABC's a breeze. Alphabet flash cards come in packs of 30 cards, 26 letter cards and 4 blanks. Consonants are printed in bold blue ink, and vowels in bright red. 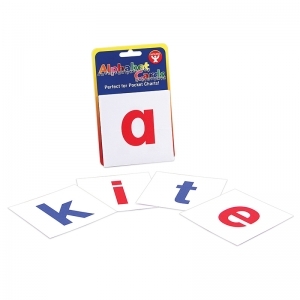 Alphabet flash cards make learning the ABC's a breeze. 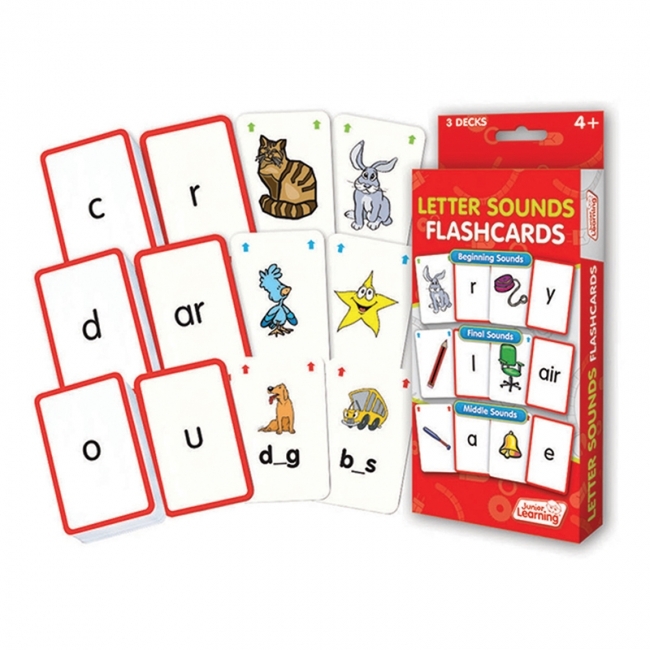 Alphabet flash card combo packs come with 60 cards, 26 uppercase letter cards, 26 lowercase letter cards, and 8 blanks. Consonants are printed in bold blue ink, and vowels in bright red. 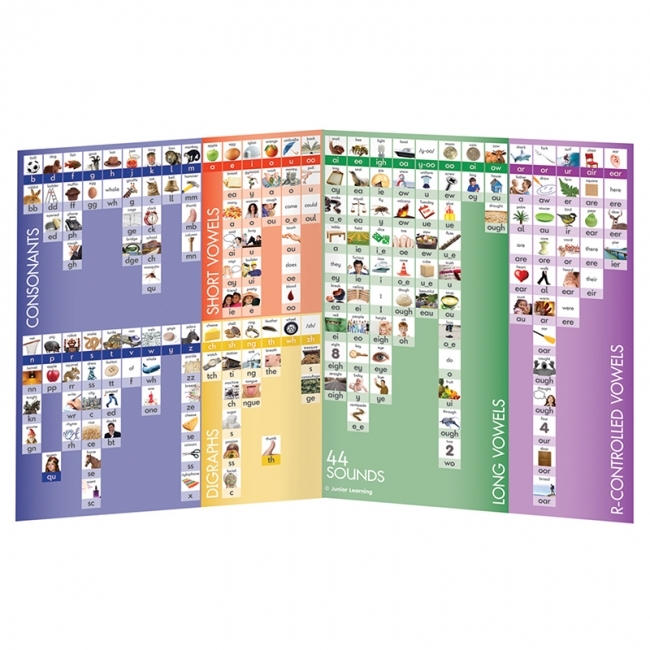 The 44 Sound Board provides alternative spellings for all of the 44 sounds of English. Picture prompts are provided throughout. 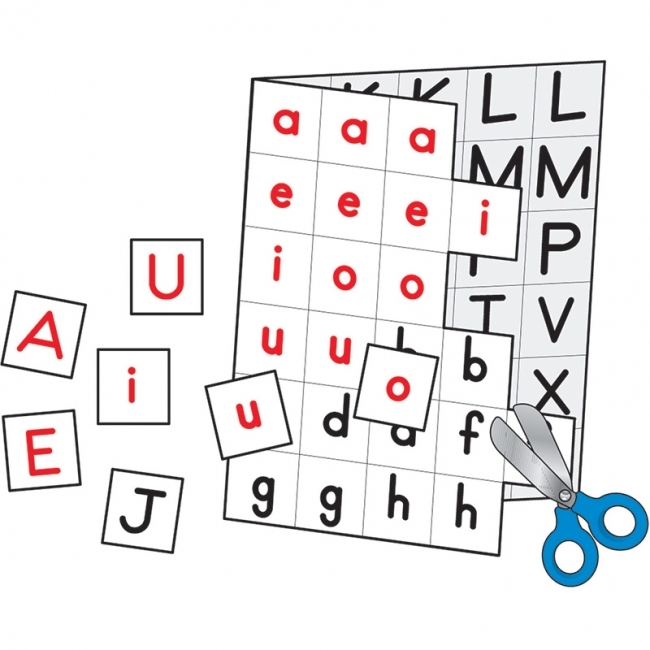 A3 folded on thick card provides a durable board that can be used to spelling or practicing the sounds of graphemes. Double-sided, the other side displays the 48 most common digraph patterns with picture example and word examples for each.